Although the Netherlands is lagging behind on wind and solar energy it has one trump card when it comes to energy saving: the bike. The Netherlands is touting one of its most popular national symbols to countries across the planet, the Volkskrant writes. In order to promote bike use and boost Dutch bike manufacturers, Dutch embassies around the world have been instructed to get peddling and involve themselves in bike-related promotional schemes. ‘There are economic opportunities, particularly for bike makers,’ Chris Kuijpers, directer general of environmental issues at the economic affairs ministry, told the paper. From China to Mexico embassies are persuading high-ranking officials to climb on and go for bike rides in an effort to highlight Dutch expertise. In Marrakesh, host of this week’s climate summit COP22, Dutch embassy personnel have been busy too, supporting a bike repair project for the locals initiated by the Pikala Bikes foundation. The foundation transports abandoned bikes from bike depots in Amsterdam and The Hague to Marrakesh where Moroccan youngsters are taught how to repair them. 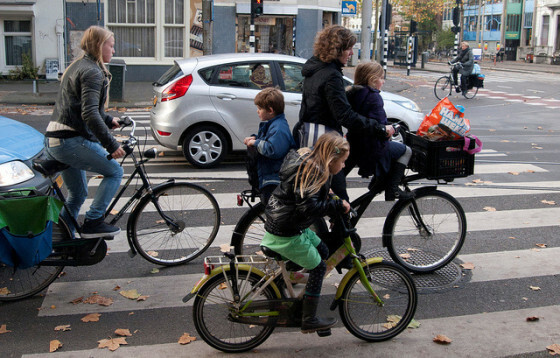 Many countries are keen to make room for bikes in their cities and are willing to learn from Dutch experience, says Matthijs van Bonzel, ambassador to Spain. Spain already boasts a number of municipal bike hire schemes and Seville is one of the most bike-friendly cities in the country. Madrid, too, is willing to give more space to cyclists, Van Bonzel says. He has even gone on a bike ride with mayor Manuela Carmena, he told the paper.